Offal-lovers, are you listening? Boy, have I got a dish for you. If you’re like me, you probably really enjoy eating freaking unusual dishes. This dish I’ve got is definitely going to interest you. 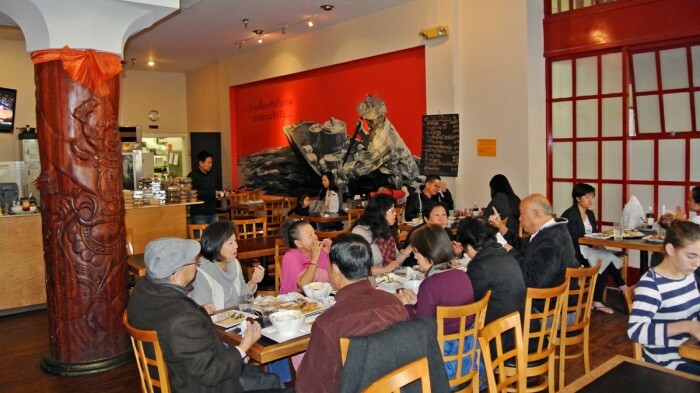 In the The Tenderloin, only a block or two from the other outstanding Thai restaurants I’ve already written about like Lers Ros Thai and Sai Jai Thai, I’ve found another place worth venturing through this crackhead-infested neighborhood to. This place is called Zen Yai and they have an off-menu dish I had been meaning to try that drew me in for a visit one morning. You’d probably never even know to order this dish unless you had the ability read Thai or enjoy scraping the internet for food finds as much as I do. 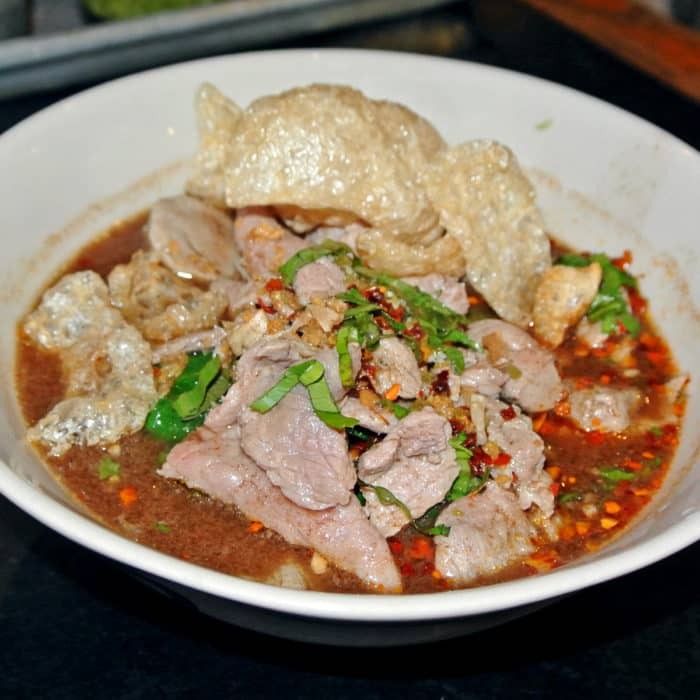 I can’t read Thai, but I did get word of this crazy dish somewhere and knew I had to see what all the fuss was about. I can’t even remember where I first heard about the dish, but one hungover day I was in the mood for soup and wanted to try something particularly funky and interesting. To be honest, I didn’t really even know anything about what I was ordering myself except that it involved plenty of offal. I was ready for the gastronomic adventure. But first, to help with the hangover, I started off with a kick of caffeine in the form of Thai Iced Coffee along with my order. Here, in the US, Thai Iced Coffee is basically extremely strong black coffee served with sweet condensed milk and is practically identical to Vietnamese Iced Coffee. I kind of love the way the thick, cloyingly sweet condensed milk combines with the aggressively bold black coffee and this was an excellent rendition of the drink. While I sipped my coffee, a tray of interesting condiments was brought over to my table presumably to pair with my meal. Most were unlabelled and I wasn’t given any information on what each was so I took a tiny taste of each of the more mysterious ones to figure out if I’d want to add them to my soup. I concluded that the platter contained granular sugar, greenish-hued pepper vinegar, ground dried chile, an oily chile sauce, and fish sauce. I was fully prepared to use these items to doctor up my soup, but I soon learned that it didn’t really need anything additional at all. Like I said, I didn’t exactly know the proper way to order this off-menu item so I had to feel out the situation. In fact, I let my waitress make most of the necessary decisions such as the type of noodles used and the kinds of meats to be thrown on top. All I knew for sure was that I had to order a “big bowl of Boat Noodles with Liver” and then I hoped for the best. The bowl the waitress selected for me ended up including sliced pork and beef balls (meatballs, not testicles) in addition to the massive hunks of liver over top of thin egg noodles. It was also (awesomely) topped with a fistful of crispy chicharrónes. The first spoonful was like a kick in the face. It was loaded with sour, vinegary flavor and plenty of ground chile spice. The noodles were springy and there was a bounty of large hunks of meat. There was just a massive amount of complex flavor and texture combinations throughout this dish. But, that doesn’t even really scratch the surface of this dish. And if you thought that the lobes of liver were the strangest and most aggressively part of this dish, you’d be wrong. The broth actually was no ordinary broth at all. It was extremely funky and unusual and that’s because it was made of pig blood. Yep, noodles in pig blood. This certainly wasn’t my first time consuming blood – I’ve had Filipino dishes and Chinese dishes that put it to good use, but this was definitely up there on the eating challenge scale. Honestly, this cheap soup was really interesting and delicious, though I don’t think I’d be in the mood for it every day. 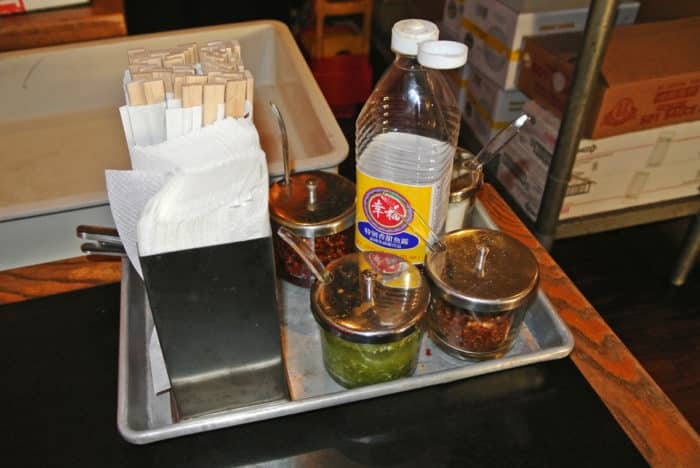 And that big tray of sauces and condiments? I didn’t think that bold, funky, unique broth needed doctoring at all. It was funky, gritty, minerally, herbal, rich, deep, unusual, bizarre, livery, garlicky, and packed a real punch all on its own. 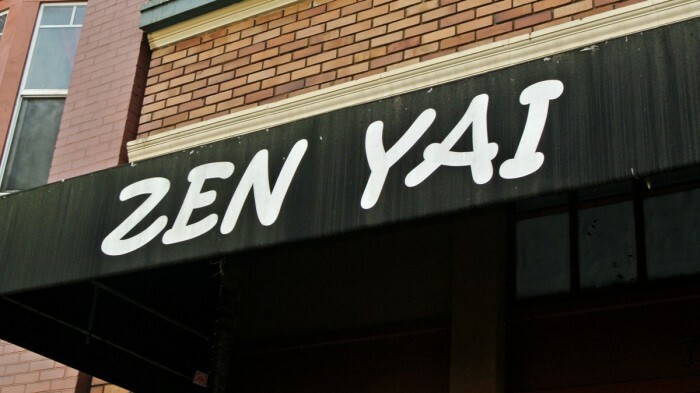 Now, I can’t vouch for any of the other dishes on the menu as I’ve only tried the bizarro boat noodles, but if you’re a culinary adventurer looking for a new, cheap dish to try, put Zen Yai on the list. Those off-menu boat noodles are totally worth a stop, if only to be able to freak your friends out by telling them you ate blood for lunch. Got another incredible offal dish in SF I need to try? Let me know in the comments below.